MamaEatsClean: Why I had to give up Coffee........and Decaf..............and Dandy Blend. Sigh. Why I had to give up Coffee........and Decaf..............and Dandy Blend. Sigh. The answer to my coffee-free existence. Maybe not. There is nothing better than that first taste, sip, gulp of coffee in the morning. That is unless it causes severe insomnia (which over time results in moodiness, weight gain, frustration and exhaustion - to name a few things). Good thing there is decaffeinated coffee for us poor souls. Nope. Actually, that's not the answer. Even decaffeinated coffee F's up my sleep. Seriously. I know some people reading this think I'm crazy or its all in my head. Its not. I started drinking decaf again in November. OH DID I ENJOY IT. But after not having one proper sleep in two months I had to look really hard at what had changed. I tried to blame the stress of Christmas (it really was a crazy December) and work and general busy-ness. But no. It was the darn decaf. I knew it. Deep down I knew it. But I kept putting it off. Looking for other excuses. I wanted to keep drinking it so bad. But I finally admitted to myself that I can't even handle decaf. BIG. HUGE. SIGH. I really am a delicate creature. A delicate creature that started sleeping again in the New "coffee and decaf free" year. But I wasn't ready to give up my morning shot of happiness. So I went on a hunt for an alternative. 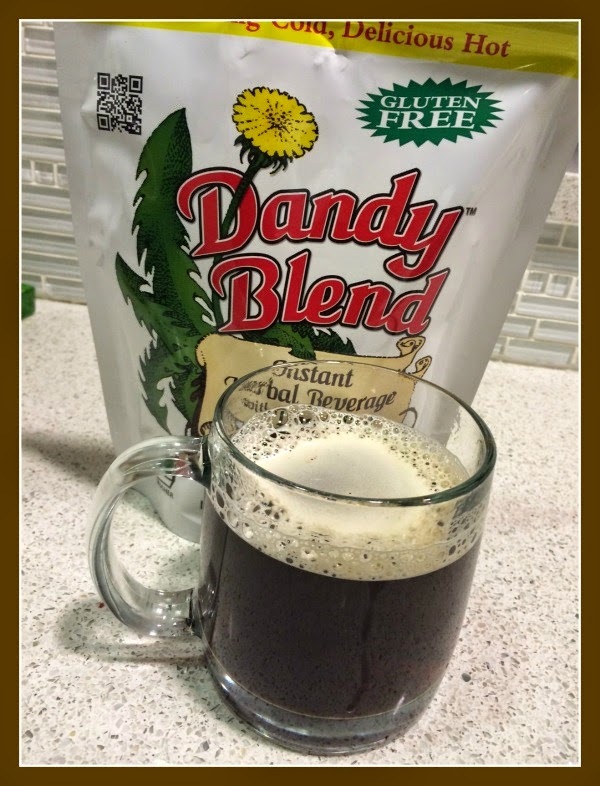 I scoured the Internet and found Dandy Blend. Yay - they sell it in Winnipeg (at Hollow Reed on Corydon). My prayers had been answered. Daddy blend is a mix of dandelion, chicory and beet roots, and barley and rye grains - are all health-promoting foods respected throughout the world. Its full of minerals, tastes great, gluten-free, etc. etc. etc. You get the picture - this stuff is the bomb. I couldn't find one issue with it (and I read a million reviews). All the granola cruncher, health-food junkies are loving this stuff. And WOW was I loving this stuff. I was making myself amazing "lattes" with cinnamon, stevia, vanilla and almond milk. Life was good. Except, there was trouble in paradise. I was noticing that I was feeling pretty bloated. After a couple days I tried blaming it on my diet.......had to be something I ate. I wasn't about to give up my beloved lattes........again. But after a week, my stomach was actually sticking out so far I looked about 4 months pregnant. And I was EXTREMELY uncomfortable. Again, I did a check-in and had a long talk with myself. Time to face facts Mama C - Dandy Blend does not agree with you. It seems to agree with EVERY OTHER bloody person that tries it. But not me. I'm pretty sure its the chicory root (I've reacted to it before). So I've gone back to water and herbal teas. And I'm surviving. After a week of withdrawal I no longer stand over my husbands coffee doing deep breathing to try and soak up the sunshine. Some people think my dietary troubles are all in my head. Some people probably think I have orthorexia (an unhealthy obsession with healthy food). But I have to live in this body. And if giving up coffee and decaf and bloody Dandy Blend makes me feel better then that is what I'll do. And trust me, if I have an unhealthy obsession with anything its good tasting food. So I wouldn't be giving up anything if I didn't have to. So if we go out for dinner and I just drink water and eat a seemingly boring and healthy meal, don't be annoyed. I'm not doing it to make you feel bad about your food and beverage choices. I'm doing it so I can feel my best - and that isn't as easy for us delicate-digestive-challenged flowers. Me too! I am super sensitive to caffeine and even decaffeinated coffee keeps me awake at night, even decaffeinated tea keeps me awake at night. I tried Dandy Blend yesterday and thought I had found a solution. It tastes great. And I was awake from 12:30am to 3am and woke back up before 6am. Not fun. I couldn't believe it was the "100% caffeine free Dandy Blend". So I had a cup this morning and sure enough I felt quite awake afterwards. I am very very tired today and headachy. I tried for an afternoon nap and lay there wide awake for an hour. I also have to face up to the face that I'm going to have to just drink water. Bye Coffee, tea and Dandy Blend. Thanks for posting MamaEatsClean. It was the confirmation I needed about Dandy Blend.